Well I'm sure if you are right that there will be an announcement coming about the print run selling out and needing a second and then another cover can be announced that they just happen to have ready with '2nd print run' across the bottom. The Forbidden Planet website looks the same as it did when I ordered mine. You can pre-order #0 with the red cover we've seen, due for release on 17/4. There's also an unrevealed cover #0 marked as 2nd printing (not as variant cover) also due for release on the same day and available for pre-order. IDK. 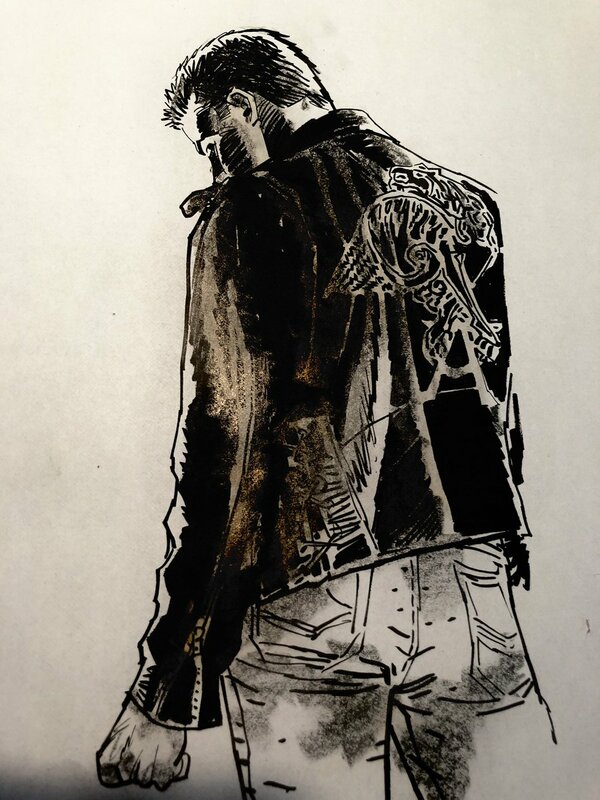 Can't see the detail on the back of the jacket but why am I thinking Hell's Angel rather than simply Angel? And, is that strange creature above the A a chameleon? I'm hoping so because I payed a bloody fortune for these specs. Last edited by TriBel; 15-04-19 at 03:08 PM. That’s Angel‘ s tattoo, isn’t it? I think this is a griffin not a chameleon. I like the reference but the style is more rock-star than I would have expected from Angel. It's a winged lion and yes, it looks exactly like Angel's tattoo. Yeah...I thought it probably was. But not Billy Idol? TBH, it looks a bit cliched to me...hence the Hell's Angel remark. Last edited by TriBel; 15-04-19 at 03:44 PM. But ... he is Hell's Angel. Yeah...James Dean works for me. Following the reboot of Buffy the Vampire Slayer earlier this year, her soul-baring vampire lover couldn’t be too far behind. With an ongoing Angel series due out in May, this surprise “zero issue” - announced only eight days before its release - sets the stage for a spin-off. But while Buffy has been fully updated for the 21st century, the vampire formerly known as Angelus doesn’t get as radical a makeover. From what we do glean of this Angel, he’s suffering from what can only be described as a persecution complex. Reflecting on his distant past, he laments “I deserve this pain.” Later, in sunny California, he thrusts his hand into the sunlight and repeats the sentiment as his arm bursts into flame. It’s the 21st century, and Angel has taken brooding to a new level of self-harm. As the issue transitions into a more contemporary setting - or at least “Los Angeles. Before” - Hill introduces some of the newer characters and a fresher perspective on the series. While the set-up is similar to the Angel television series, in that the vampire with a soul helps out with paranormal investigations in L.A., this is a different kind of redemption story. While training an ally named Helen, there’s someone else named Fee-Fee who is given no context whatsoever. It scarcely matters, as the fragmented story skips off to fight a demon in a sequence that only serves to dispatch of a character we’ve just met. Gleb Melnikov and Gabriel Cassata are on art duties for this preview issue. A stylistic match for the Buffy comic, it doesn’t have the same polish as Dan Mora and Raul Angelo’s work, but retains the likenesses of the 1990s television counterparts. The rough-hewn pencils work best during the Angelus flashback sequences, as the puffy-shirted vampire is underlit by fire and lightning. The perpetual twilight of L.A. is a nice counterpoint to Sunnydale, and Melnikov’s liberal use of speed lines gives the action sequences a perpetual feeling of motion, even if they don’t always gel together into something cohesive. In the book’s backmatter, veteran Buffy editor comments that the series “reimagines (only slightly) the titular character.” So while this is just a preview, it does little to define who this new version of Angel is, or what makes him distinct from the original version. The issue quite literally ends with one of Angel’s sidekicks telling him to “Try a place called Sunnydale…you might make a few friends.” If it was an issue of Buffy, it’d feel like a backdoor pilot, but for now we’re content to wait another month for the full debut to arrive. More details about BOOM! Studios' surprise launch of a new Angel ongoing title have been revealed in the company's letter to retailers. The series, which was announced just one week ago, debuted Wednesday. "Welcome to the very first issue of our new Angel monthly comic book series," writes BOOM! 's Retail Sales Coordinator Morgan Perry. "You've seen incredible success with our other launches of Joss Whedon creations, from Firefly to Buffy The Vampire Slayer and this joins them as our third ongoing series from the aforementioned visionary creator." The publisher is giving Angel #0 to retailers for free (including free shipping and no fees), with orders matching the store's orders for Buffy the Vampire Slayer #3. BOOM! also added in one free copy of Boris Pelcer's "Thank You" variant. "BOOM! Studios is your best partner and we believe in putting comic shops first," Perry continues. "As a publisher who is asking you to buy in to what you believe, we have a responsibility to do the same. So we chose to cover every cost (creative, publishing, shipping, etc.) so that Angel #0 would be additional money in the hands of retailers with no strings attached." Perry went on to explain that BOOM! did the Beyonce-style surprise debut to "inject surprise and excitement into the direct market." "We minimized the window of awareness to conversion so that the broad, diverse cross section of pop culture fans (some of whom may be lapsed comic fans or have never stepped in a comic shop) who heard the news could be converted into Angel #0 readers almost immediately," the BOOM! representative said. "Our goal is to inject surprise and excitement into the direct market with a new release that rewards comic shop retailers for their unwavering loyalty and reinforces that these stores are the front line of innovation in the entertainment industry." Second printings of Angel #0 are available to order now, featuring a recolored version of Boris Pelcer's main cover. 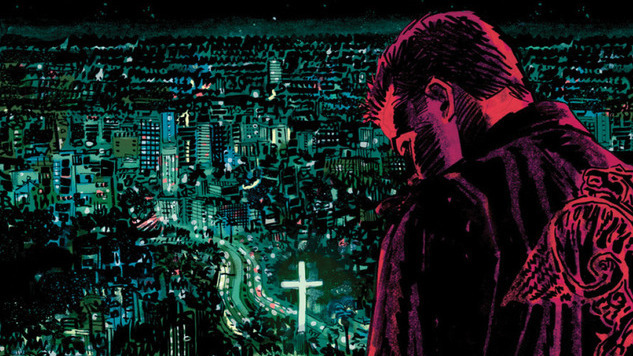 The series will continue monthly, with Angel #1 in May. Retailers who participate in the BOOM! Guarantee program will receive full returnability on Angel #1 through #4. Here are the solicitations for Angels #1 through #3. Angel walks the line between two worlds; a vampire cursed with a soul, he's spent centuries battling back the forces that would destroy humanity, in an attempt to redeem himself for the crimes committed by the monster he was when he was first turned. But now, when the trail of the most recent demonic uprising takes him to Sunnydale, he realizes that the redemption he seeks can only come at a startling price. The landmark re-imagining of ANGEL continues here from Bryan Edward Hill (Detective Comics, Killmonger), Gleb Melnikov (Mighty Morphin Power Rangers) and series creator Joss Whedon (Buffy the Vampire Slayer, Marvel's The Avengers). Los Angeles is becoming infested with more supernatural threats than ever before-and Angel needs to know why before he can complete the rituals to become human once again. But the vampire-with-a-soul's quest for redemption won't be as simple as he hoped (I mean, it's already super complicated because he was, well, the mass murderer Angelus) when a new threat arrives on the scene and forces Angel to truly examine his past. Angel's made his move and now he's dealing with the unintended consequences as the true threat facing him may be greater than he imagined. But one wrong choice may destroy his life as he knows it...and ruin his chances to lift the curse. Is there any price too high when redemption is the prize? The next exciting chapter of the pop culture reimagining that made headlines worldwide continues from Bryan Edward Hill (Detective Comics, Killmonger), Gleb Melnikov (Mighty Morphin Power Rangers), and series creator Joss Whedon (Buffy the Vampire Slayer, Marvel's The Avengers). I'm getting a bit fed-up with Boom's marketing ploys. I went through that and got to just being amused by it. I'm beginning to feel they're taking me for a mug. And Buffy #4 is already available to read on certain sites. I might stop buying the individual copies. Sorry if this has been posted somewhere else . . .
A little over a week ago, Paste helped break the news that BOOM! Studios, the new home of the Buffy the Vampire Slayer comic series, had prepared a secret launch for their companion title, Angel. Revealed to the public just eight days before a special zero issue clandestinely hit comic shops, Angel springs directly out of Buffy the Vampire Slayer #4 and will follow creator Joss Whedon’s vampire-with-a-soul in both the modern day and throughout his infamous past. Written by Killmonger and Detective Comics scribe Bryan Edward Hill and drawn by Saban’s Go Go Power Rangers artist Gleb Melnikov, Angel returns to shelves May 29th with its official #1 issue—and Paste has an exclusive first look at covers and a plot synopsis. 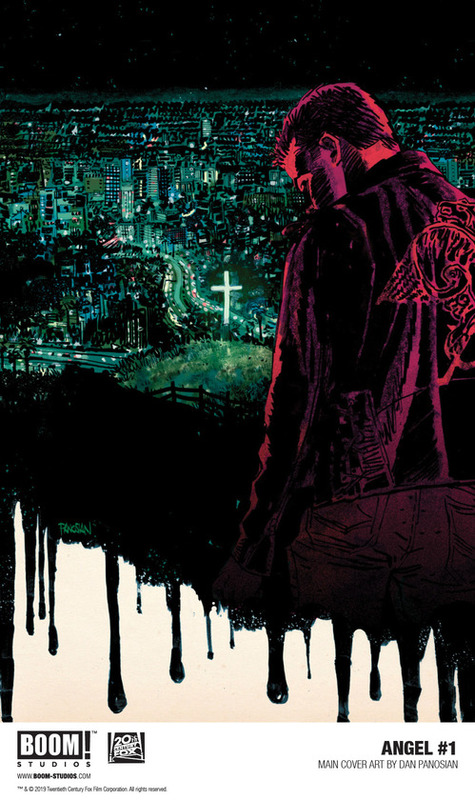 Angel #0 and Angel #1 kick off with a demonic uprising that leads Angel away from Los Angeles and straight to Sunnydale, where he discovers that the restoration of his humanity can only come if he takes one more life: a certain Slayer he’s never even met. The brooding vamp is still reckoning with the latest death on the never-ending list of debts he owes against his soul—can he make one last sacrifice if it means finally knowing peace? 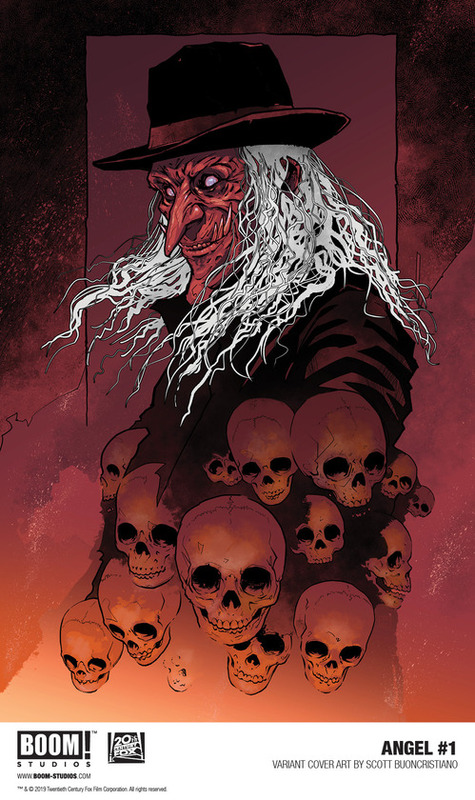 Paste readers can take a first look at Angel #1’s main cover from Slots creator Dan Panosian, along with a monster-themed variant cover by illustrator Scott Buoncristiano depicting the terrifying Der Kindestod, from the Buffy the Vampire Slayer season two episode “Killed By Death,” above. For more on all things Buffy and Angel, keep your stakes (or fangs!) sharpened at Paste—and don’t forget to check out our interview with Angel writer Bryan Edward Hill, too. Seems strange to use the motw from Killed By Death for an Angel cover. But he is one of the scariest looking monsters from the show and the art is very good. I'm deeply annoyed - it's discriminatory not to release the issue digitally! 'I was turned when i was still a boy . . . ' this is them facing the age issue head on, and I like that. It also makes me think we may get Bangel at some stage, or why would Angel's age matter. We expect vampires to be old, even ancient, to tell us on page two that this guy is just a kid, I think it must mean more than just showing his similarity to Xander. This Angel reminds me of the last Angel we got in the Dark Horse comics, a 1950's chiselled hero type. The whole comic has a very 50's noirish feel to it, which improves throughout. I enjoyed this more than I expected to. It was very slight, but it was a nice set up. I prefer the character of Angel in this comic to the character of Buffy they've created in her comic. Not got mine yet. It might be there when I get home. Shock horror...I'm at work. I was turned when i was still a boy . . . ' this is them facing the age issue head on, and I like that. It also makes me think we may get Bangel at some stage, or why would Angel's age matter. We expect vampires to be old, even ancient, to tell us on page two that this guy is just a kid, I think it must mean more than just showing his similarity to Xander. Yeah...I thought that when they mentioned he was 18. The whole comic has a very 50's noirish feel to it, which improves throughout. Good...I was hoping they'd go there. It also explains the "James Dean" look.